Now. 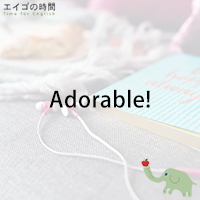 Why am I talking about “adorable”? Well, a little while ago, a new pet shop opened up in my neighborhood with a cat café upstairs. I’ve never visited the café, just window-shopping from time to time on my way home from the nearby supermarket. And I have mixed feelings about selling puppies and kittens at pet shops. But that aside, they all look so pretty. Absolutely adorable! Now, would you like to practice together? It’s just a single word, but please repeat after me. Ready?